That's the first word that came to mind when watching NHL Deputy Commissioner Bill Daly flip over the 1 card which had the Buffalo Sabres logo on it. It's been decades since the Sabres have had the first overall pick in the NHL Draft and after some pretty ugly seasons leaving Buffalo as the bridesmaid for all the suffering, April 28th, 2018 was finally the date that broke the spell. The format the NHL used to announce the winners of this year's draft lottery was new and wasn't much of a burden for those fan bases who had vested interest in the outcome. Prior to last night's San Jose Sharks-Vegas Golden Knights Game-2 clash, the NHL revealed slots 15-4 for the upcoming 2018 NHL Draft. 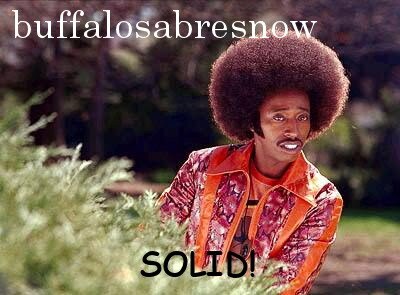 For the Sabres and their fans, the No. 4 slot was crucial. As the last place team this year, Buffalo could drop no further than fourth-overall in the draft so the flip of 4 would have much meaning for the Sabres. Their logo was not there so Sabreland was left to wait until the second intermission of the game to find out picks 3-1. Which was a good thing. Odds are that hockey fans in Buffalo didn't mind watching the first two periods of the Sharks-Golden Knights game as the local market is always near the top of NHL TV ratings anyway. Having their team guaranteed a top-three pick with a shot at the No. 1 overall was an added bonus. And it was a good game too. The second intermission hit and Daly revealed that the Montreal Canadiens, who had the fourth-best odds to land the first overall pick would be drafting third-overall. He then flipped over the 1-card with Buffalo's logo on it leaving the Carolina Hurricanes will pick second, which isn't really bad for a team that finished 21st in the league and landed in the 2-slot with only a 3 percent chance of doing so. Those in Sabreland had been through this lottery movie twice before in the past five years. They watched their team come away with the second-overall pick in back-to-back years after finishing in last place both times. I guess third time really is a charm as the cliché goes. The fanbase in Buffalo has been suffering for three of the last five seasons with the prior two last place finishes being tank years. This season, unless there was a stealth tank going on, was a disaster of it's own accord and maybe there was a bit of karma in the works. But for whatever reason, Buffaluck had finally turned from lousy luck to good. "I'm just very, very happy for our fanbase," Sabres GM Jason Botterill told the gathered media post-draft lottery. "I hope they're ecstatic. Look, they've been extremely supportive. You felt it in the building [this season]. There was certainly a lot of quietness coming into the games, but whenever we did something well, they wanted to cheer. They wanted to be supportive. "Hopefully people in Buffalo have been excited the past few days." The past two days have been quite exciting for Buffalo sports fans as their beloved Bills did some maneuvering to land a player they believe will be their franchise quarterback. Bills GM Brandon Beane, who was flush with draft capital to use this year, made two moves to go from 21st overall to 12th and then to 7th to select quarterback Josh Allen out of Wyoming. While the front office was thrilled with the pick, the fanbase was up in arms. But regardless of that, Beane did very well in going out and getting the QB he wanted. The Bills followed that up with another trade up in the first round as the went from 22nd to 16th to select middle linebacker Tremaine Edmunds who has what some have termed as freakish qualities at his position. In nearly every corner of draftland, the Edmunds pick was given high, if not perfect, grades. Buffalo had only one pick yesterday but they landed a quality player in DT in Harrison Phillips which, again, many draftnicks lauded. But that wasn't the only thing about that Day-2 selection. Hall of Fame WR Andre Reed and beloved Bills tailback Fred Jackson were on the stage to announce the pick and were joined by Pancho Billa, a legendary member of BillsMafia based in Dallas, Texas, the sight of the NFL Draft. Ezra Castro, aka Pancho Billa, has been battling cancer since last fall and his announcement of the pick was felt league-wide. There were other Bills picks yesterday as the NFL concluded their draft with rounds 4-7, but for Buffalo fans the night belonged to the Sabres as they landed the first overall pick for only the third time in franchise history. 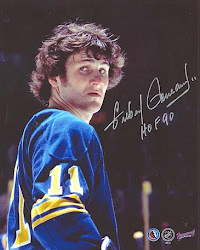 The first time was in 1970, their expansion year when the legendary Punch Imlach and his team won a spin of the wheel to win the rights to select Hall of Famer Gilbert Perreault as their first-ever draft pick. The only other time Buffalo picked first was in 1987when they selected Pierre Turgeon. "This is a good day," Botterill said. "… If you look at any of the of the top players, they have a history of being successful players. That's what we need more and more in our organization." Buffalo has never had a franchise defenseman and the top player Botterill's talking about this year, in all likelihood, is Swedish defenseman Rasmus Dahlin, the consensus first overall prospect who many see as a franchise defenseman. "[He's] the type of defenseman that pretty much all 31 teams in the National Hockey League want these days," said Botterill who watched Dahlin at the 2018 world juniors in Buffalo. "Just that ability to jump up in the rush and create offensive chances, but also have that competitive spirit to play against other teams top players." Botterill feels that winning the lottery and bringing in a player like Dahlin will bring an excitement level to the ice. "Players are drawn [to] and excited about playing with other skilled players. We're going to bring in a player who has a history," said Botterill before changing it to the plural as to include all the top picks, "if you look at any of the top players they have histories of being successful players and that's what we need more and more of in our organization." Having star first overall pick like say, Dahlin, could make for a very attractive situation when trying to lure free agents to Buffalo as well. "Our hope is that it plays a big part in that," said the GM. "It's not just him it's our other young players in the organization. You look at the centermen we have with Jack [Eichel], Ryan O'Reilly, Casey Mittelstadt, then you have Sam Reinhart who can play center or wing. We fell we have some good young players we can build around." Botterill was also quick to point out that owners Terry and Kim Pegula "are willing to give us the resources to try and bring free agents in," he said. "Hopefully the [free agents] see the situation and see that the Buffalo Sabres are moving in the right direction." It's a feel-good situation for Buffalo sports fans as well as they've been feeling like the proverbial dog being kicked for the past decade-plus. Prior to this past season, the Bills went 17 years without making the playoffs and the Sabres haven't made the playoffs in the last seven. Yet week after week, year after year Buffalo sports fans head out to support their favorite teams. It hasn't been fun for Buffalo fans, but this weekend sure was.